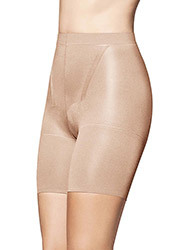 This has always been, by far, one of our best base layer products, and now Spanx have decided to go and improve on it even more! The slender lines and slimming cut of the Thinstincts Tank Top make the body seem taller and more svelte, and that has always been true. Now though Spanx have added an extra breathability feature to the material, making this tank top not only lightweight but also comfortable and functional. It can be worn under any of your favourite clothes for an added layer of coverage.